Please go to the contact page and let Josephine know. In these timely and thought provoking essays, Josephine presents the core of her natural healing philosophy while covering topics from poison oak and inflammation to injuries and nutrition. She captures and consolidates the most potent wisdom of her thirty years experience as a natural healer, spiritual life coach and metaphysician. She reminds us that the choices we make everyday create who we are; whatever we think and do right now becomes who we are tomorrow. This is a delightful little book on health and healing. Josephine’s strong voice for loving change will lead you right into the heart of a life full of positive possibilities and good health. This little treasure book is filled with unapologetic honesty, wit and homegrown wisdom accumulated from personal experience and deep intuition. Coupled with a reverence for all life, and heart big enough to embrace the family of this shared earth, Josephine speaks with clear, casual, simple delight. Yet she also employs the voice of a courageous mother-bear and modern-day elder. What a wonderful book filled with practical advice for health and healing. I have copied and passed on to my female friends the section on Symptom Free Menopause and all have found it very helpful. My only criticism is I wish the book held more chapters! From her weekly radio show, I know Josephine has a wealth of knowledge to share and I do hope that in the future Positive Possibilities will expand to include even more health tips and advice. I found the advice in Positive Possibilities to be practical, down to earth and very useful. The healing check list at the book's end is a great road map to help recover from any bout of illness, and you can adapt it to fit your own daily program. I also followed the recipe to great effect for Josephine's Super Tonic Cold Cure. It defeated several newly developed colds and sore throats. Warning: the tonic carries quite a mule-kick to the taste buds but it carries an even greater kick to the virus-especially in the early stages of a cold. My only criticism is that my wife refuses to kiss me three hours after the dosage (too much garlic and horseradish for her tastes, I suspect). Oh Josephine, if only you had a full-proof cure for kisses denied! Keep up the excellent work, and I look forward to reading future articles from the Positive Possibilities Series. Deep healing wisdom and insight is shared with a fluidity that captures the reader and makes it accessible to everyone. and a joyful heart makes this book a rare gem. Mind, Body, Spirit- Josephine Laing touches on the whole being and offers up common sense techniques for living a healthier life. Her conversational style is a pleasure and her personal stories are a treasure. I look forward to more of her sage advice in future publications. 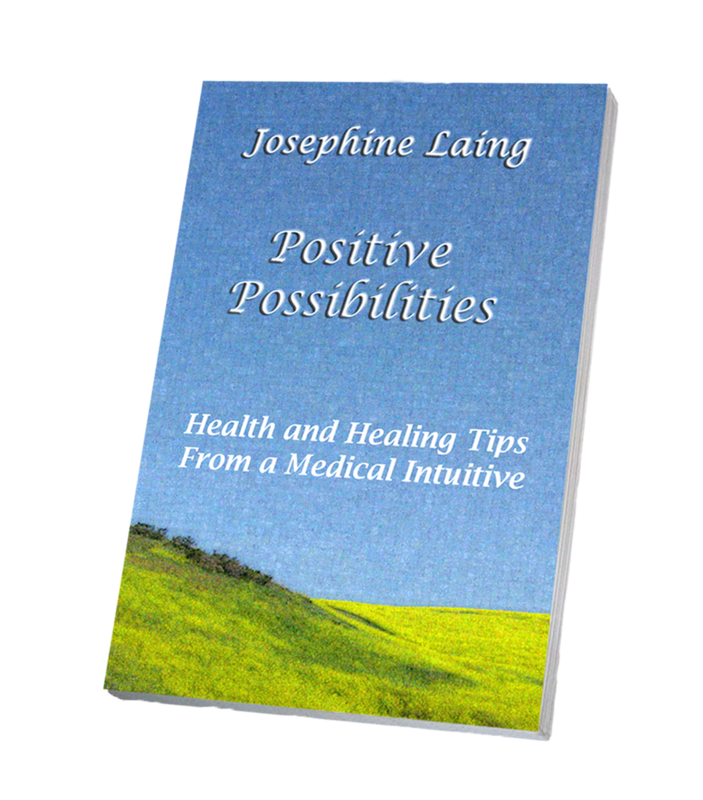 This is a guide to better living that Josephine gathered through years of healing knowledge put into practice. Her relaxed style makes life satisfaction feel attainable.